Finally! I have been storing 'before' photos for weeks awaiting Vickie Lea Designs, the most wonderful landscape designer, to do her thing with my pots! Vickie Lea prefers more color and has wonderful ideas, but with the colorful beds of impatiens I have going on, I didn't feel the need for more color! The fact is, I have an addiction and it's called boxwood and ivy. Let's break it down, shall we? Several years ago I got a glimpse of Dan Carithers' patio/garden and I was beyond smitten. 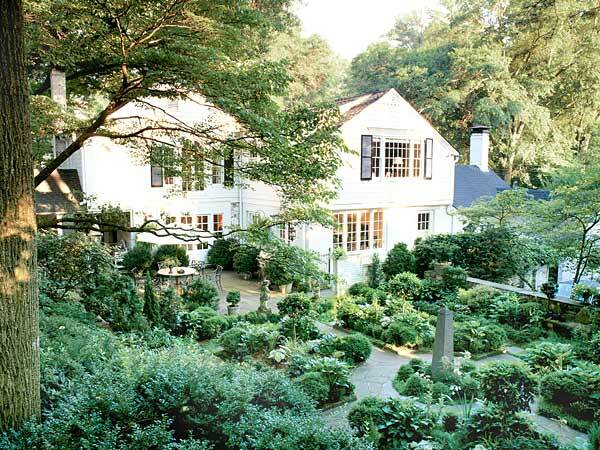 This would be my inspiration for the ultimate backyard.... My sister-in-law actually drove me by his home in Atlanta, and we peeked since she knew he was out of town. (It's not as creepy as it sounds... he was doing work for her and she could have been stopping by to chat...) The patio was immaculate and dreamy with boxwood and ivy everywhere! As obsessed as I am with color, I am surprised at my passion for this garden design where the colors are strictly green and white. Now, my yard has much more color than Dan's, but the boxwood and ivy are a definite theme. If I'm in the mood for more color, it's easy to add with pillows, smaller plants/flowers, pottery, and other decorative objects. The boxwood and ivy provide a rich backdrop and set the stage for a gorgeous patio, front porch and garden. Green is my favorite color after all! Obviously, replicating this look would take years. I have big plans to grow Boston ivy up the fence, but the green layers in this beautiful Atlanta yard have been in the making for decades... such exquisite inspiration. So finally I have 'after' photos to put with the 'before' photos... plus some additional backyard images so you can see what an amazing landscape designer Vickie Lea is... this backyard was literally grass and a fence just 3 years ago! 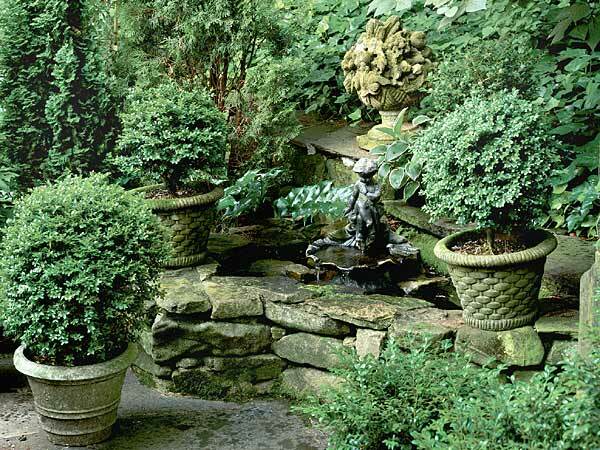 Just look at what a difference boxwood and ivy makes! We enjoy these gorgeous boxwoods from inside too! You may notice the little helicopters from our Maple trees scattered about... a constant battle in May. We are so discouraged by the mess these little monsters create every Spring- our driveway is covered and with the rain, it's a disaster. But come June, the helicopters are gone, and even with the mini Maple tree reminders that spring up everywhere, the mess is forgotten and we are thrilled under the shade those big Maples provide. Thank you Vickie Lea! Just in time for Memorial weekend! Your yard is absolutely gorgeous and I love all the green accents. I have several large containers with boxwood in them and I’m going to under plant them with ivy as well. I didn’t realize how much the ivy would dress things up….beautiful! Thank you for the tip! I also love ivy and particularly the small leaved ivy. Always useful in so many places. Your garden is de lovely! I will trade your helicopters for our cicadas. It all looks beautiful. 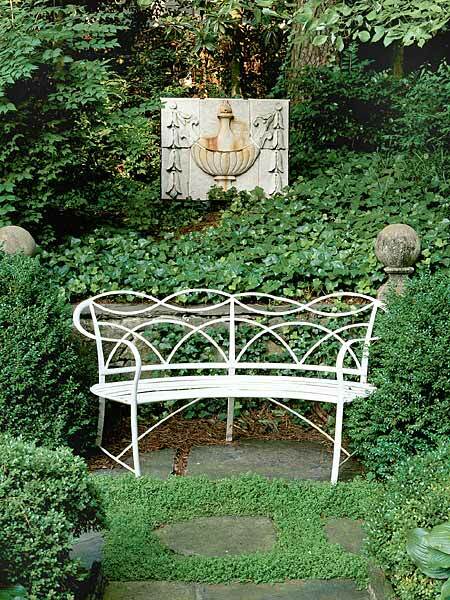 Wow.....love the simplicity of boxwoods and ivy. So elegant, fitting for any setting. Your backyard is GORGEOUS and is picture perfect for all of your summer entertaining!!! This is fabulous and fun! Having passed on my 10 year garden magazine collection when we downsized,which I so enjoyed,I can now enjoy yours! It's all about the viewing and the dreaming now--not in the backyard, but on our urban balcony. Wish I had included some of these shots in my post too, Jan.
Absolutley wonderful!! Great shots of Chicago Botanical and great shots of your yard. 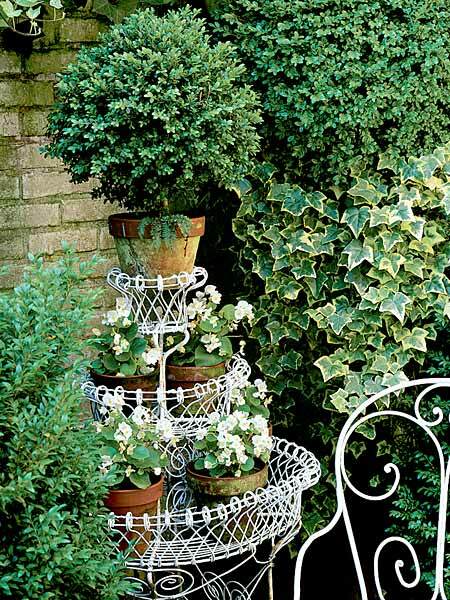 Love the ivy that has been added to your boxwood! I just might have to do the same!! I loved the BEFORE AND AFTER ahots especially! Thanks so much for sharing Jan.
found this post in your archive. I'm smitten with the boxwood and ivy now too. I have both and I must mix them tomorrow. I had fun pinning so many of your photos. All beautiful.